Our filter socks are excellent at trapping particles floating in aquarium water to produce crystal clear water. We have two types of filter socks: one type sock has a drawstring, and the other has a plastic ring around the top allowing it to fit into a sock holder in a filter called a sump. In a sump filter dirty water from the display tank pours right into the top of the filter sock where particles are trapped. Then, clean water flows through the fibers of the sock into the sump from where it is pumped back to the aquarium. When dealing with a drawstring sock you will find that the flexible top is not easily mounted into a socket. Drawstring socks must be tied off onto a spout or pipe from the aquarium and a lot of times you can tie it off when the pipe comes from your aquarium, you can just strap it to the pipe that drains the water from your aquarium into the filter bag. 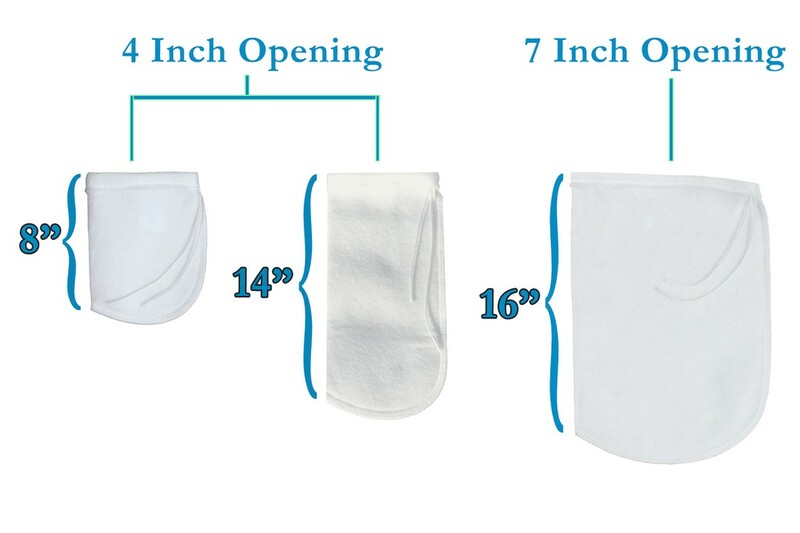 Our drawstring filter socks are constructed of very thick material with thick string to make it easy to tighten. Because the material is so thick, however, it will not close tightly around a small opening like it would if the material were thinner. It will not fit snugly uless the pipe is large enough. For smaller pipes, the pipe will just drop past the mouth of and into the center of the sock, water will flow to the bottom. As long as the socks are changed often, you shouldn’t have any water splashing back out. These very heavy duty filter socks are constructed of durable polyester. While they are also available in polypropylene, we prefer polyester for our filter socks as they don’t seem to pill after washing, and have very little oil on them. Polypropylene can initially cause a protein skimmer to go crazy; Polyester does not have those problems. Polyester socks are very durable through multiple washes, so this is a way I like to go. As mentioned earlier on, particles are trapped by this filter sock. The sock will start to clog from the very bottom and work it’s way up. If you don’t change and clean these filter socks, eventually the water will overflow from the top. So, change these filter socks often to remove the nutrient load. If the organica stay in the filter sock, they will break down into phosphate and nitrate. Most hobbyists change them once every week or two if the load is not heavy. Some hobbyists with high end reef tanks will change them a couple of times a week. Some even change them daily. Whatever works for you but the more often you change these filter socks, the higher the water quality is going to be. To change these filter socks first tap or shake the contents into a clean bucket (used solely for your aquarium) to see if anything has been collected in there. Strange as it seems, hermit crabs, snails, and even fish are sometimes found trapped in filter socks. There are different ways to clean these socks. Some people take them into the sink and rinse them off. The problem with this method is that the 200 micron pores are very, very tight and are difficult to clean at the sink. Some people use a pressure washer and power wash them and that works fairly well. My preferred method is to use a washing machine with bleach. For details on this method please check our website; go to our resource page to find every single step. Don’t miss any steps. It’ll tell you exactly what to do to get these socks clean and ready for your tank. I like to get a group of dirty socks together rather than take time to clean one or two at a time. To do this, just remove the dirty socks from the sump (be sure they are free of live creatures) and put them into a plastic bucket with a lid. Once a group is collected, I follow the steps to wash them in a washing machine. For this method, buy them in bunches so as to always have a couple of extra ones ready to use each time socks need changing. Your filter socks are ready to be thrown away when their threads begin to wear down or the seams pop open. Sections of the sock may become thinner as the material wears down; as you start to see the material become thin, toss it away and purchase new filter socks to maintain ideal water quality.